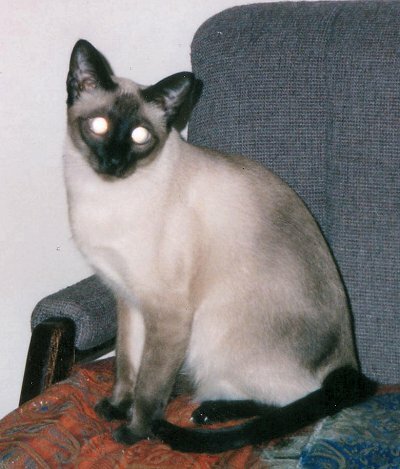 Zippy the Siamese cat was born on July 6, 2002, at Marl Creek Cattery near Barrie, Ontario. 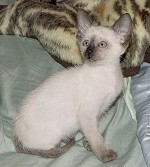 He is a cross-eyed cutey with energy to spare so what else could be name him but Zippy! He loves to run at full speed through the house and has nearly demolished his scratching post. Thankfully he hasn't really taken to jumping on top of things yet or nothing would be safe! He has a ton of toys and his own pet fish he loves to watch plus his favorite window seat where he can watch the pidgeons who live on the roof. 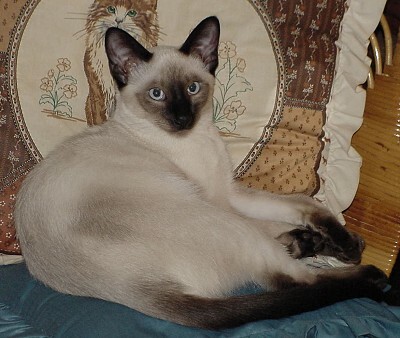 Sadly, Zippy came down with lymphoma in December 2010 and declined rapidly as he refused to eat. We had to have him euthanized on January 13, 2011. 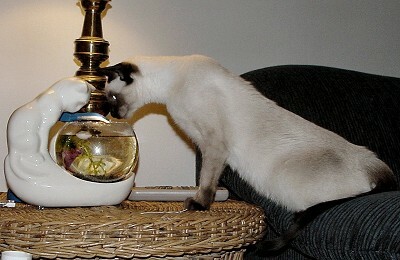 He was shortly followed by his buddy Copper on February 14 at the age of 20 due to the infirmatites of old age. They will be missed. 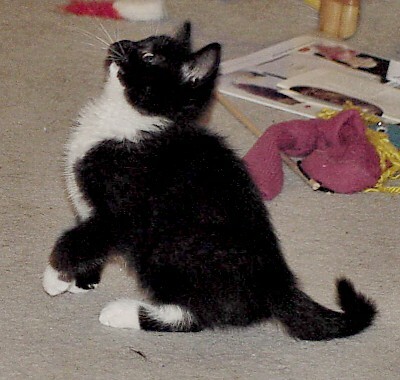 Here is Zippy when we first brought him home in on September 2, 2002. He only weighed 1 1/2 lbs. then but he sure had a loud voice as he screamed at us the whole way home from Barrie (about a 2 hour drive). 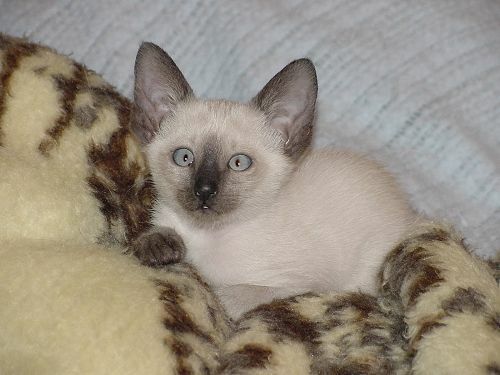 Given the size of his ears in proportion to his head at that age, it was very appropriate that he seemed to be saying "ears" when he meowed. This picture was taken in December 2002. He wasn't even 6 months old yet and already he weighed 7 lbs! Zippy could never be accused of having a finicky appatite. He eats just about anything and has some very unsual foods he will actually bed for like coconut, pasta, broccoli, baked beans, and corn. Of course he also likes more usual cat favorites like chicken, ham, beef, and lamb, even if they are cooked spicy. 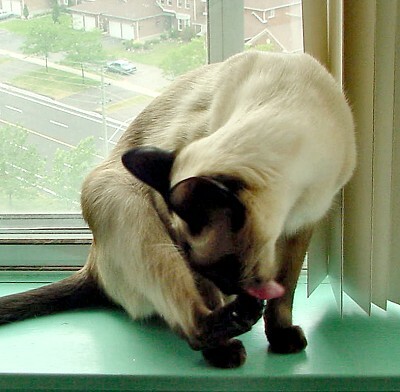 He eats his regular cat foot too with his favorite brands being Royal Canin and Eukanuba. This is Zippy and his big buddy Copper. Copper is a ginger tabby who is about 12 years old and weighs 16 1/2 pounds. He was already an adult when he joined the household in 1992 so I am not sure of his exact age. 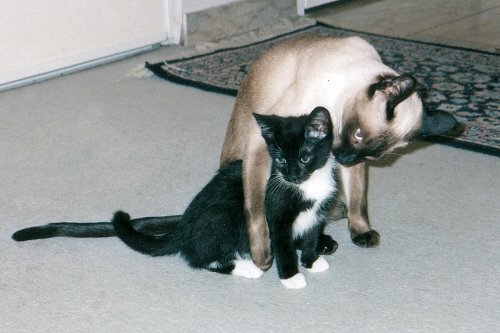 Copper was the youngest in the family before Zippy joined it. 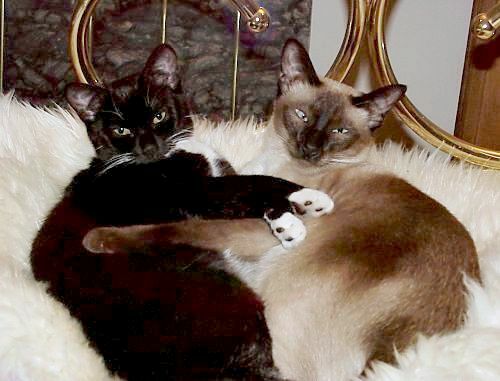 He took to Zippy very quickly and they have been best buddies ever since. Sometimes Copper will call for Zippy to come play and they will have huge wrestling matches and chase each other through the house. Here he is just days away from his first birthday sitting in his favorite bird watching window. He is up to 10 1/2 lbs now and just as frisky as ever. He hasn't turned as dark as I thought he might, but he has a cat bed with a heating pad in it that he loves to lay on which has probably contributed to this. 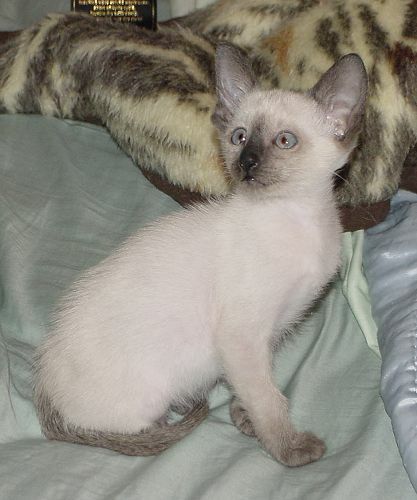 The gene for the Siamese coloration results in heat sensitive skin and fur, warmer areas of their bodies stay lighter while cooler areas get dark (face, ears, tail, feet). This is why they are born white because of the heat in their mother's womb and gradually get darker. 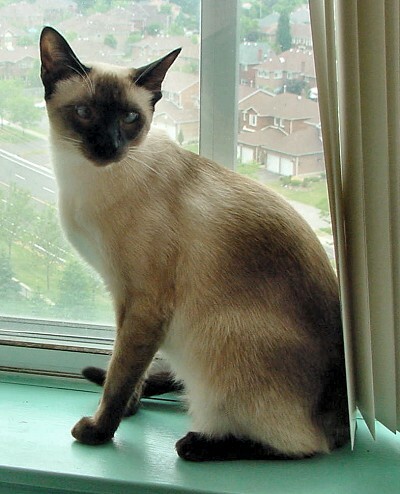 Siamese who live in colder climates will develope darker coloration than those who live in warm climates. For Zippy's first birthday we got him the ultimate cat toy: a kitten. We hadn't planned on it, but we saw this cute little black and white girl in the store and she begged us so hard to take her home that we just couldn't leave her there in that cage! 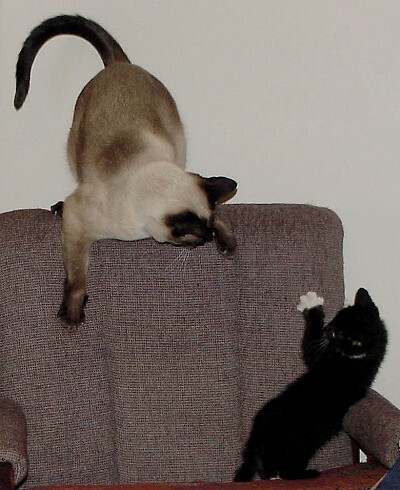 Zippy wasn't too thrilled with the idea at first, but on the second day he started following her around and acting like he couldn't decide whether to be angry or try to play. By the third day, he started playing with her and seems to think she wasn't such a bad idea after all. Here they are playing on my computer chair, now known as the jungle gym. Her name is Lightning because of the white lightning bolt down her belly and the way she zooms around quick as lightning. Here is Zippy showing off his headlights in the flash and to the right is Zippy with Lightning after one month together. As you can see, Zippy loves his baby. They sleep together and he loves to lick her, wrestle her, and zoom all over the house playing chase. She is growing very quickly and is already up to 4 lbs. now while Zippy is at 10 3/4 lbs.